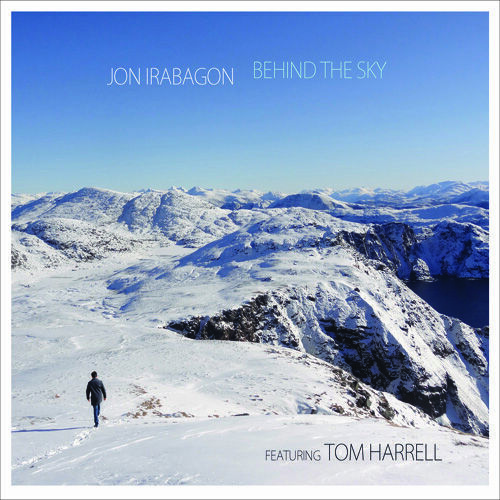 2008 Monk Competition winning saxophonist JON IRABAGON, a fiercely uncompromising stylist of remarkable eclecticism, has proven his versatility not only as a sideman for Mary Halvorson, Dave Douglas and Barry Altschul, but with his own, daringly assorted studio releases. These include 2015's Behind The Sky, itself a diverse yet polished collection of distinct compositional statements, and Axis, a lengthy, 2-track free group improvisation brought out earlier this year. Now a highly accomplished and firmly established player on the New York scene, Jon gave us an insight into his rise to stardom and a brief glance at what to expect from him in the coming years. Interview by Jake Werth. London Jazz News: What Challenges did you face when moving from your native Chicago to New York City? Jon Irabagon: I moved from Chicago to New York in 2001, a week before 9/11. The economy and gig scene was destroyed for a while. But that didn't even matter, because I moved to town in pre-social media days, so I didn't really know anyone and hadn't thought about networking. It took me several years to find a group of people whose playing I enjoyed, with whom I had sessions and eventually started playing my music. It was a long process, perhaps longer for me than most, but the rewards were in the music, the people I've met and the places I've travelled since. It was definitely wood-shedding to a certain degree. LJN: How important was the 2008 Monk Competition for your career and what opportunities did you gain from winning? JI: The Monk Institute is an amazing educational tool with great support from jazz educators and famous people. When I sent in my audition tape, I didn't plan on getting into the semi-finals, but in doing so, I had the opportunity to be around Wayne Shorter, Jimmy Heath, Greg Osby, Jane Ira Bloom, Herbie Hancock, David Sanchez and others who not only defined the music, but stuck to their guns on the kind of music they wanted to make. That was the most important part of it – picking their brains about aspects of the jazz business, putting out records and sticking with one's own voice. The Monk Competition doesn't necessarily guarantee jazz stardom anymore, but it was a great opportunity for me and the money allowed me to make some artistic decisions I wouldn't have been able to make otherwise. More than monetarily, though, it was a vote of confidence to continue trying to pursue my own voice. LJN: As an accomplished band leader and sideman, having worked in the Mary Halvorson Octet, the Dave Douglas Quintet and Barry Altschul's 3Dom Factor, what did your sideman duties teach you about being a strong leader? JI: I've been lucky that my vision and the kind of music I make melds well with certain band leaders. I've honed my skills in lots of big bands, and as a gun-for-hire in many different creative projects. In every experience you try to gauge what you love about working for different band leaders and under what circumstances things can be difficult. It's helped me to try to be a fair band leader that asks a tonne of their sidemen whilst being realistic about my expectations. For the kind of music I'm wanting to make, I think being a sideman for a number of years was essential. 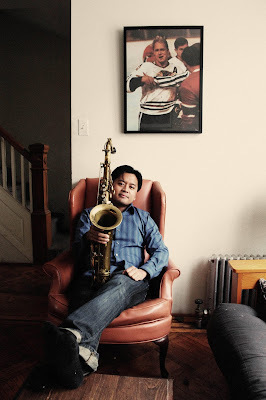 LJN: You've received a number of significant cultural awards for your work, the French-American Cultural Exchange, 2012 Mabuhay Award from the National Association of Filipino-Americans and the 2014 Philippine Presidential Award. Do you feel your cultural background has an influence on your musical approach, stylistically or otherwise? JI: Being born in Chicago, I'm a first generation American, and both my parents are from the Philippines. My dad has 10 brothers and sisters, almost all in Chicago, so there were definitely some cultural attitudes present in my upbringing that have made their way into my music. On Outright!, there's a tune that starts as a traditional New Orleans tune that quickly develops into a wall of noise from around 35 musicians playing simultaneously. I didn't realise until much later, but some of the greatest moments of my upbringing were during parties where there would be so much high-spirited, high-energy noise. In hindsight, that has definitely influenced some of my music. As far as jazz goes, I'm really an American at heart, and the tradition has been ingrained in me. However, some of the carefree, fun-loving attitudes come from my cultural background. LJN: We understand that you undertook the project of transcribing every John Coltrane solo on record. Other than for musical enrichment and personal enjoyment, was there any other reason why you chose to do this? 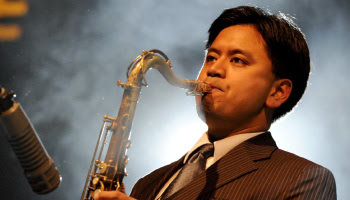 JI: When I started as a professional musician I was strictly an alto player – my first love was Cannonball Adderley. However, Chicago is a tenor town, so I picked up tenor and tried to get better at it. When I moved to New York, I realised to truly become a tenor player I needed to plug some holes in my playing, I couldn't just switch from alto. So I looked back through the lineage and chose to dig into each of the masters as much as I could. When I arrived at Coltrane's playing I really noticed the difference between his bebop playing in the army in the late '40s and his playing less than 20 years later on Interstellar Space. I dove into Coltrane transcriptions to try and discover what the building blocks might have been. LJN: And how far along are you? JI: I'm almost at the end of the classic quartet recordings, just before Meditations, where things change pretty fast. The important off-shoots of learning transcriptions themselves were some of the bigger musical ideas, allowing me to come up with my own exercises inspired by things like hearing Sonny Rollins play an idea, abandon it for five choruses and return to it without missing a beat. When I practice a Bird blues, can I leave an idea, develop it, and come back to the original idea? Those are the things I've been learning about transcription more recently, in contrast to what we learn to do earlier on which is often learning licks and plugging them in. How can I strengthen my own voice from my interpretation of the voices of masters? LJN: You were involved in a major project recreating the classic album Kind of Blue by Miles Davis note for note. How did yourself and other members of Mostly Other People Do The Killing handle the inevitable kickback from parts of the jazz community upon the release of Blue in 2014? JI: The band had been together for eight or nine years at that point. The idea came from us talking over the course of lots of train journeys and flights on tours. It was organic to the four main members of the band, just like the music was. The band toured once or twice a year in Europe at one point but we found it hard to tour the United States, just because it might have seemed too crazy for straight ahead jazz audiences. So we did it for ourselves, to see if we could do it, and to see how well we could do it. I myself didn't expect any kickback at all. Some of the criticism was 'you should record your own music'. When these critics were told we'd written eight or nine records already, they weren't aware of that. So the selectivity of some of the criticism seemed pretty interesting to me. But we hit a nerve and it was just one of a string of internet outrages that exists. However the advancements in my playing that resulted from learning those Coltrane and Adderley solos can't be taken away from me, and I'd never take the experience back. LJN: Tell us about your experiences running your own record label, Irabbagast Records. JI: Originally, I just wanted to put out my own music and get used to the business side. I also got tired of sending my music to labels and either not hearing back or being offered production time a year and a half later, by which point I wouldn't want to hear it anymore. So I decided to start my own label and learn. Then, after putting out my first five albums, friends with similar frustrations towards other labels started wanting to put their music out. I try to help with distribution and publicity, just to help expand a fan's knowledge of what's available. Style isn't important, I want to support honesty and try and help out as much as I can. LJN: Axis, released in February this year, marked a stylistic departure from a more conventional composition-based Behind The Sky, released in 2015 alongside the highly experimental solo sax album Inaction Is An Action. What comes next? JI: There's a new record that's coming out hopefully by the end of this year but probably by the end of next year, which is the same band as the one on Behind The Sky, but I've written more intricate tunes for them. I wanted to take the working band mentality and write tunes with more sections and more interplay. On Behind The Sky, each tune is about five or six minutes and the album is quite tightly produced. This next album has tunes containing more group interplay, with one of my all time favourite trumpet players Tim Hagans. I'm also recording a solo album to follow up Inaction Is An Action, using an F mezzo-soprano saxophone. I've also written a piece for string quartet plus piano, consisting of six movements, so I'm recording that soon. I recently played at the Jazz Standard with my organ trio, for which I've written music. It features Gary Versace on organ and Nasheet Waits on drums, and next year I aim to record with that group. LJN: What advice might you have for younger musicians hoping to move to NYC? From your perspective, at what point is it right to make that decision? JI: As the world becomes more global, there's a chance people might not need to move here. I have Skype students that live out of town, and if they ever ask me about it, I always tell them they should at least visit first. Some people's personalities don't mix with the craziness here. But if you're one of the people that won't like it here but want the enrichment it can offer, you'd need to be proactive about getting that in other ways. If you're trying to be a professional musician, you owe it to yourself to at least be around it for a while, and if you're the type of person that could deal with it then I'd suggest you move here as soon as you can. Always reflect on what you want out of your music and what you're willing to take a stand for, because once you do that here there's a target on you: If you're the most inside cat, you're not 'doing anything crazy'; if you're the most outside cat, you obviously don't know the tradition; and if you're trying to toe the line in-between then you're a charlatan because you obviously can't do either well. So that's one of the difficult parts about moving here, but it's important for any musician to think about what they want to take a stand for anyway.